Update 26 September 2015: more from Nicholas Stuart and Gai Brodtmann MP. Update 25 September 2015: Helen Vatsikopoulos writes. A cheeky reflection from Mark Kenny, noting the past history of two of those present. Yesterday in Canberra saw the unveiling of the memorial to war correspondents. 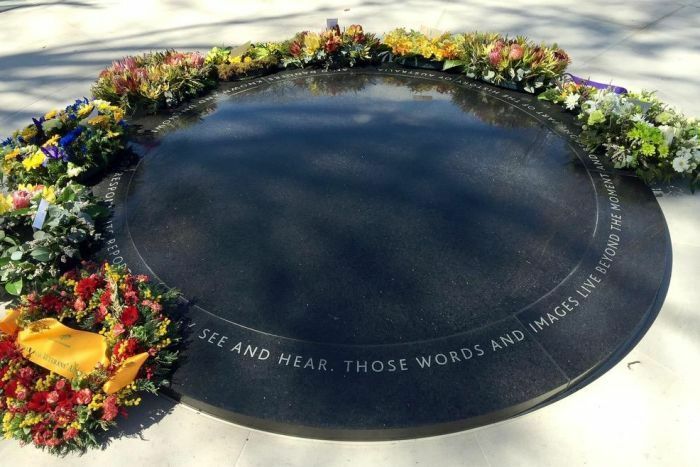 The prime minister spoke – the plaque had been rapidly edited in recent days – and wreaths were laid, including one by Peter Greste and one by Shirley Shackleton. There is a full report on ABC Online and coverage also from the Canberra Times and News. The memorial was wrangled by the CEW Bean Foundation. It is located in a corner of the grounds of the Australian War Memorial, far enough away from the Memorial to signify the distance and independence that war correspondents try to maintain. As correspondents like Michael Ware and others have noted, getting the right balance between closeness to the action (requiring cooperation from the military) and reporting honestly has become more difficult than ever. ‘Embedding’ goes hand-in-hand with sanitising, access has a cost. Focusing on individual journalists, the recent biographies of Bean by Ross Coulthart and Peter Rees also show how conflicted Bean’s role was and warn us against seeing him in simplistic terms as ‘Mr Valiant-for-Truth’. Finally, there are Alan Moorehead and Wilfred Burchett, distinguished Australian war correspondents of very different philosophies.